The music video for your single The Sights just came out. What was it like being the first band to perform in space? [laughs] It was an experience, definitely. It was a really, really fun video to make. We got on really well with the director, we’d met before because there’s a fair bit of comedy in this video but we were a bit nervous that it would come across in the wrong way. I think after we’d met face to face we were very confident that it was going to come across well. So once that had happened, it was just really exciting and really good fun. Was it the idea of the band or something the director suggested? It was the director’s idea for the video to be set in space and then to kind of get worse and worse as it goes on and turn into a bit of a disaster. Yeah, it was really easy and one that jumped off the pages as we were reading it. For us it was just making sure that the comedy was going to be done in a way that we would have wanted it to be done. It’s taken from your latest album, The Spark. Tell me about the album. Well it’s a few weeks old now. It took us about eight or nine months from start to finish (write, demo, record) and really, the album is a big step for us. It’s our fifth full-length album and it’s probably the largest progression we’ve made as a band really. A lot of people are saying it’s not as heavy and it’s a lot more focused on structure and melody and really, we just wanted to focus on being able to write the best songs that we could. The lead single Live Outside kind of set the tone as an album that wouldn’t be as heavy as your past discography. Was this what you set out for when writing? Obviously, we never said ‘there’s not gonna be any guitars or no heavy parts or anything’. With the previous record, we’ve always gone into the studio and we’ve never known what was going to come out until we’d actually been in and experimented on the records. This record, we had a lot clearer idea of what we wanted it to be and that was simpler structures. We used to feel pressure in terms of trying to be the craziest band or the heaviest band or the most diverse band and we’d try and fit everything onto one album while with this record there’s still a lot of diversity on and we wanted it to be simpler and a bit more focused, so that was really our main objective. 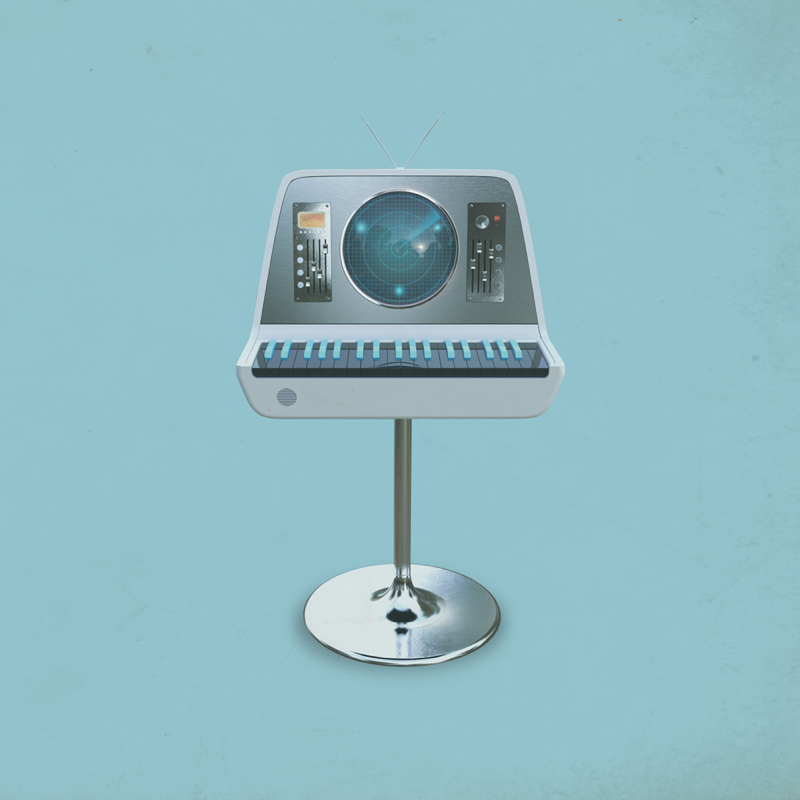 Enter Shikari have the Shikari Family Facebook group for your listeners to interact with each other outside of a concert situation. Do you ever just find yourself looking through and seeing how they get on? Yeah occasionally. Our fans are very vocal with us on social media, quite often we get tweets from them pointing out things that need our attention. So, it’s really nice to be involved and it’s amazing that this community is built off the back of people having a shared interest in music. Do you think other bands would profit from having a place for people to interact? Yeah, I think most bands would. It’s not so much for the bands really, it’s more for the people who like the music and so they can find like-minded people who they can start friendships with and yeah, I think it’s a valuable asset to have. Over the summer, Rou launched something of a twitter tirade against Taylor Swift’s Verified Fan service calling it sickening and exploitative. Does it shock you that this was conceived as a legitimate method of battling touts and bots? Yeah, yeah it did. I’ve forgotten the finer details of it but it seemed pretty preposterous to us all in all. It was something of a throwback to the same argument against paid VIP experiences you made in 2014? Again, that’s something that we’re totally, totally against. For us, it’s just a way to flog your fans that you’re supposed to be caring for and looking after because they’re the ones that really nurture the band. We shouldn’t be fleecing them and charging for meet and greets, setting up different tiers which is essentially just a rip-off. You’ve got a tour coming up, in celebration of the spark. Tell me about what we can expect? Well for the last two months, this tour has been our primary focus so we have been busy creating. Most of the shows are in arenas so we have got no real restraints on what we can do production-wise. We’ve been working a lot on the lighting and the themes that are gonna be running through the show, which is some very exciting stuff. We’re mixing the show in quadrophonic which is essentially a surround sound. We’ve just been working on lots of cool creative ways we can make an impact and give people a show that we wouldn’t normally be able to give them. The first person we ever saw to use the quadrophonic sound system was Roger Walters at a festival called Coachella and we were just blown away, and since that day – and that was a long time ago now probably over ten years ago that we saw that – since that day, we’ve always wanted to do it. It’s taken us a while to get to where we can so we’ve been really focusing on that, should make the show really exciting. Take My Country Back is probably the most overtly political song on the album. When I heard it, I was thinking Brexit and Trump? Were these the original influencers to the song writing? Yeah definitely. Definitely Brexit, definitely Trump. The line ‘I don’t want to take my country back I want to take my country forwards’. That was the first lyric to go in that song. And that song is, on the record, probably most similar to our previous work. It’s probably the most aggressive song on the record so the lyrics really needed to be something poignant. It’s really focussed on hate-mongering and around the time there became a big influx about refugees and immigration, so really, it’s just in answer to that. It’s a year since he was elected, do you think he’s gonna last the full term? I don’t know [laughs]. I mean, I hope not but I don’t see anything happening that’s immediately going to change things. We can only hope. Supercharge, your collaboration with Big Narstie came out shortly before the Spark. Was this meant to be a crossover point between The Mindsweep and your most recent album? Not really. Not consciously anyway. We’d had that song, or versions of that song we’d been working on, for probably a year before we actually managed to get Narstie into the studio with us. It was something that didn’t quite fit with what we were doing at the time and wouldn’t fit on the record so we kind of kept it in our back pocket because it was definitely more grime than our previous stuff. We felt it was worth nurturing and waiting for the right person and the right thing to come along, which it did in Big Narstie. We’re starting to get a few festival announcements for 2018. You guys headlined Slam Dunk this year, might we be getting any surprises for next year? Our main focus at the moment is this tour so I think once we get that out of the way, we can hopefully focus on some festival appearances. Unfortunately, nothing to report at the moment. Obviously, the Spark making the top 5 of the UK charts will have brought in quite a few new fans who haven’t heard your back catalogue, what would you say to these people? Welcome essentially. If you’ve just heard the Spark, there’s a lot of our previous work that is worth checking out but really, I think they’ve come and joined us at an exciting time. The Spark marks a change in the way we write music and the way we want to put ourselves across and I think it’s a very exciting time to join. 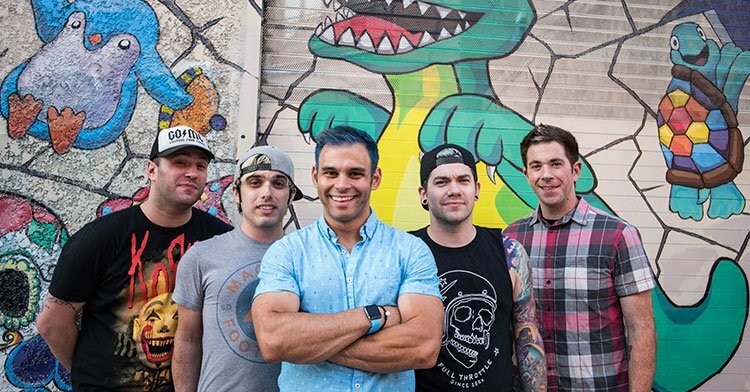 Patent Pending are back in the UK for another Spring Break tour and before the second family reunion started at Manchester Academy 3, I caught up with lead singer Joe Ragosta who had to be prised away from a growing queue of adoring fans wanting selfies and signatures. Tom (TD): Yeah if you could all just like introduce yourselves to begin with? Jamie (JD): So you guys are currently touring to promote your new self-titled album which was released yesterday, (which is) fantastic by the way, (I) love it. What was the recording process for the album like, and how did you go about to make the album sound the way it does? HR: Do you know Bruce Rintoul? JS: In the UK I’d say! JS: You get too attached to stuff, you know what I mean? JT: Yeah sometimes you just need someone to be a (jerk) for you and then you feel a lot better, so we’ve like whittled it down and then just recorded it in a few places that we were familiar with. Rather than having to fork out for a fancy studio somewhere, we’ve ended up just sticking to what we knew and refining it as best we could. JS: Aye, and it’s like we know it works, we’ve recorded in Chem19 and 45 (A Side Studios) loads of times, it’s like if there’s no problem (to) fix, you know what I mean? Why change when you know it works? JS: In terms of the songwriting, I think we get bored very easily. I think a lot of the songs on the album were written quite last minute, not like as in the day before but I think if we sit on songs for too long, you overthink them, and you think “Oh, I don’t know if I like that anymore” and you start changing it too much. But I think that works for us. Don’t get me wrong, the more you play them live, the more you develop them. TD: So do you guys each have a favourite track off the album? JS: Yeah. I think “I’m Wired”, that’s my favourite. TD: What do you like about that one? JT: Like it’s always one of those ones where you feel you’re getting away with something quite naught by having something like that in one of your songs, like you shouldn’t be able to do this but we can! TD: Yeah? What about the rest of you? Do you agree? JT: We (Hamish and myself) ended up having the same favourite last night but I’m going to change mine up and say “Wander”. It’s a song for a long time that we’ve had in various versions for ages and then never quite committed to finishing it, and when we did finally finish it and start producing it, I think the three boys had really liked it for a long time and it took you quite a while to bond with it until you heard it recorded? JS: I hated it. And Bruce, Bruce is the one that’s always got my back so I was like “yeah I don’t like this one”, but Bruce was like “No, this one’s going on the album” and I was like “for God’s sake!” But I love it now, I do. Again, it was Bruce. With the production of it and stuff, now I genuinely love it. He completely converted me. JS: Oh I did, I genuinely did, when I was listening back to it, I was like “What the hell” like, it’s just a nice feeling. TD: Do you think you perform it better now after hearing it? JS: Yeah, just don’t look at her, YOU’LL TURN TO STONE! CI: Kinda goes with your haircut doesn’t it? TD: And you next (Hamish)? HR: Our van driver Steven! JS: Aye, this is our van driver Steven. WHO IS THAT MAN? WHY IS HE NAKED? SV: Me and Dave, the tour manager, encompass Dunfermline on both ends, we’ve got our eye on you! JT: Why don’t you introduce yourself? SV: Hi I’m Steve. I’m the best. JD: Fair enough! So yeah, for Scotland, Scotland’s produced a lot of great rock artists over the years and pop artists. Do you guys have any influences from those Scottish artists when producing your music or performing it live? HR: Yeah, like see when Puzzle came out? JS: Was that the big flag thing that dropped? JS: Do you know they cut that up and put it in their album? HR: Oh that was Only Revolutions, but I know what you mean. But yeah, it was incredible. Amazing. JS: See, I quite like the Cocteau Twins. 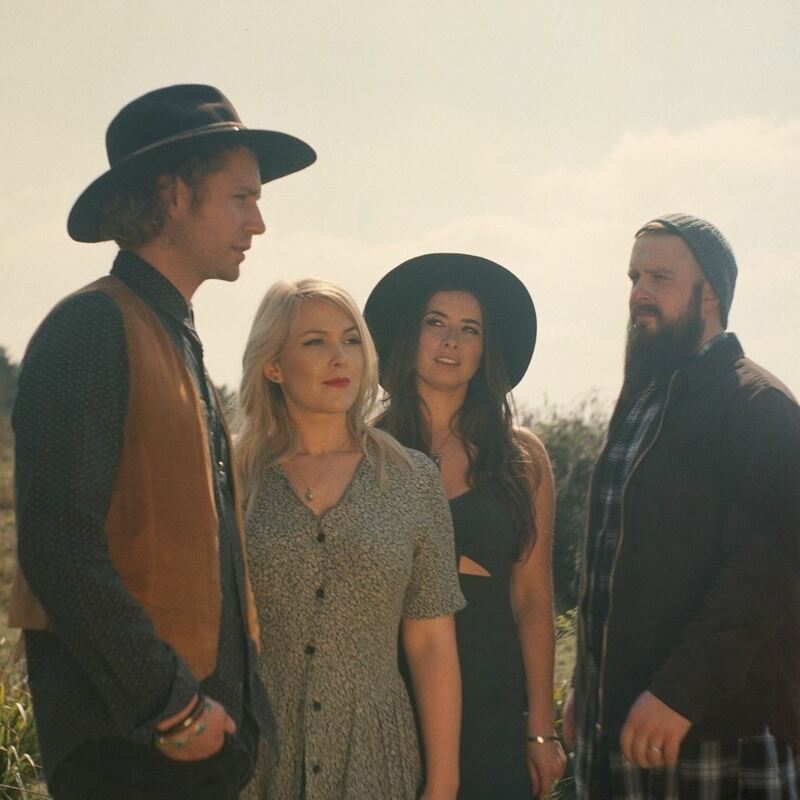 A lot of folk say that I sound like them a lot, and it wasn’t until I listened to them that (I realised) they’re amazing, and they’re Scottish. JS: The Cocteau Twins they’re called, they’re amazing. And I never really heard of them before. TD: Right, yeah. What about besides Scottish artists? What kind of influences do you cite? JS: For this past album, Bring Me the Horizon’s a huge influence, in terms of record production and in an innovative sense, I think they really inspired us. I wouldn’t say we sound like them, but certain things that we’ve picked up a lot on from their album, I just think it’s perfection. HR: It’s why you like dark songs, isn’t it? JS: Aye, exactly. And they portray that amazingly. It’s dark, but very catchy. JS: That’s a great description! A great description of our band! HR: From any time period? HR: What Bring Me song? JS: Well, are you guys up for that? TD: We’ve got a lot of options. We’ll pick one if that’s easier? HR: Yeah, you guys pick one! JD: Alright, we’ll do that then. Need to ask about the music videos because I really like them I think they’re really cool and unique. Do any of you guys come up with the ideas for the music videos? JD: Ahh right. So does that explain why for “Target Practice” you end up with a rocket launcher and a tank Hamish? HR: No, “Target Practice” was one of the only videos we did with a video production company years ago. JS: Yeah, they’re friends of ours. HR: Is that even still online? HR: Yeah, “So Long Gone”, “La Di Da”, what else have we done? JS: I think, because Hamish is more technical minded, he can do all the editing, and he’s got a better eye for what shots to take and what to look out for, whereas I don’t have a clue with that, so I just come up with an idea, and it can be something like mermaids diving off a cliff and Hamish will go “Right, cannae really do that, that’s not going to be possible”. He’s good at steering me, as in like that’s going to work and that won’t. JS: Yeah, what she said! 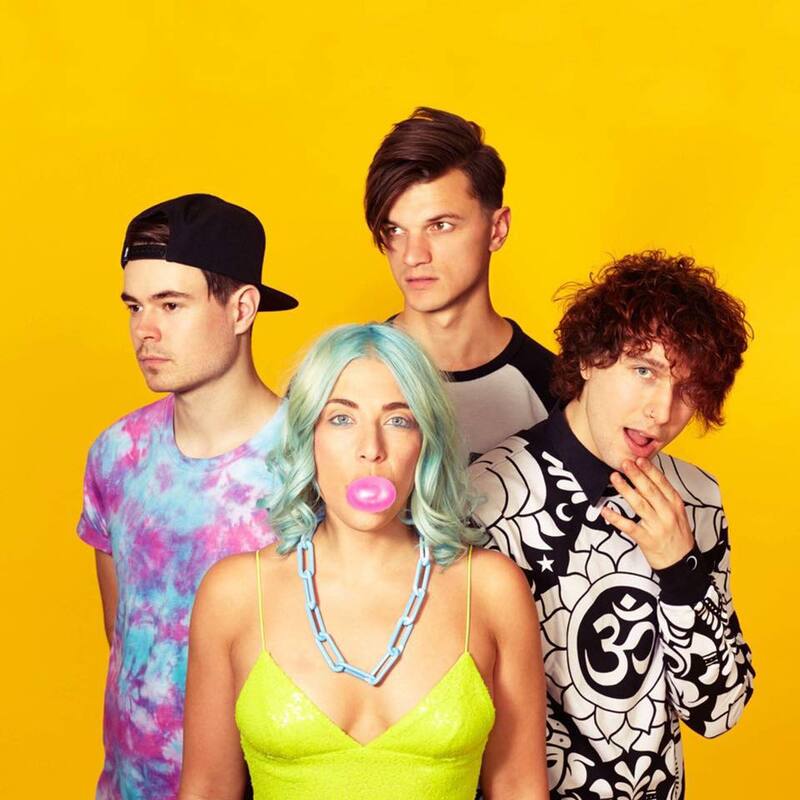 TD: What would be your favourite moment be being in Vukovi? JS: Yeah, like you know when you’re trying to not cry and your lip’s all like that (quivering)? I was just like, what the hell is wrong with me man? It was just unreal, and overwhelming. HR: I’d say before that it would probably be Download (2016). Playing at Download Festival is sick. We all spent the whole weekend there and we were knackered, soaking wet, covered in mud, and then I’d seen like some of the best bands in the world that I grew up listening to, and then went on stage and got to play in front of 1000 people. It was like, this is it! This is what it’s all about! JS: Me and Colin… the backstage area, the VIP area was amazing, but me and Colin on that day, we didn’t realise that our passes meant that we were allowed to use all of the facilities. So we kinda just walked into this tent and there was a masseuse, a tattoo artist, hairdressers, chef, bar… we just walked in and sat there all day, and it wasn’t until the last 2 hours when we were like that: “by the way, I think we’re forgetting about this!” and we were gutted because we realised we could, we were trying to cram in and get a sleeve tattoo! HR: Was there a tattoo artist there?!?! JS: Aye, there was like a top tattoo artist, like one of the top tattoo artists in the country, and apparently his assistant was this famous pin-up girl, stunning pin up girl, and I was just sat there watching all day and honestly I would’ve gotten a tattoo. (Could’ve gotten) Free tattoos, my hair done, get a massage, food, so I was raging! JT: And there was us, freezing our butts off… we could’ve gotten a haircut! JD: Can we expect any more festival announcements, like Reading and Leeds possibly? HR: I think there’s more tours as well. Actually I think we’re announcing another tour really soon! JD: Sweet. Last question really, have you got any advice for upcoming and coming musicians who want to make it in the music industry, like us? JT: Yeah, don’t be terrible and don’t be a jerk! That’s our two go-to ones, isn’t it? HR:…everyone you can because favours because favours go so far! Do you guys play in any bands? JS: Awesome, you’ll need to send me a link! JS: Yeah, yeah, exactly, if they’re the same genre, just see what they’re doing and see how they approach things. I take it you’ve done recordings and stuff? JS: But that’s good that you’re not just kinda sat up and gone and played 100’s of gigs, because that’s just like, don’t just play all of the like, do you know what I mean? JT: Here’s a tip for recording-wise: practice a lot and pre-produce. JT: So, before you go in, know exactly what you’re going to do before you go in. As in like, if you’re unsure about the structure of a song and think “ahh, we’ll figure it out”, figure it out before you go in, as you’ll save yourself a lot of time. JS: That’s the beauty of it. The more you play a song, and that’s what’s amazing about songs, you write it at first and you think “It’s alright, maybe it’s not bad” and the more you play it, it totally flourishes. Like, everyone starts to get into their own style, and that’s what’s the best about it. HR: What is it you guys are recording? Like a single, or an EP, or? HR: Cool. Have you played any shows yet or? JS: How the hell did you do it? HR How did you do it? JS: Is it like Tinder for bands? JT: Were you at the show in Norwich before? JD: Ahh no I must’ve missed that one! JT: Because when you said that you were from Norwich, it sounded very familiar! TD: Right, cool, great, well thanks for speaking to us today! JS: Yeah, thanks for coming! HR: Forgot we were playing a show! 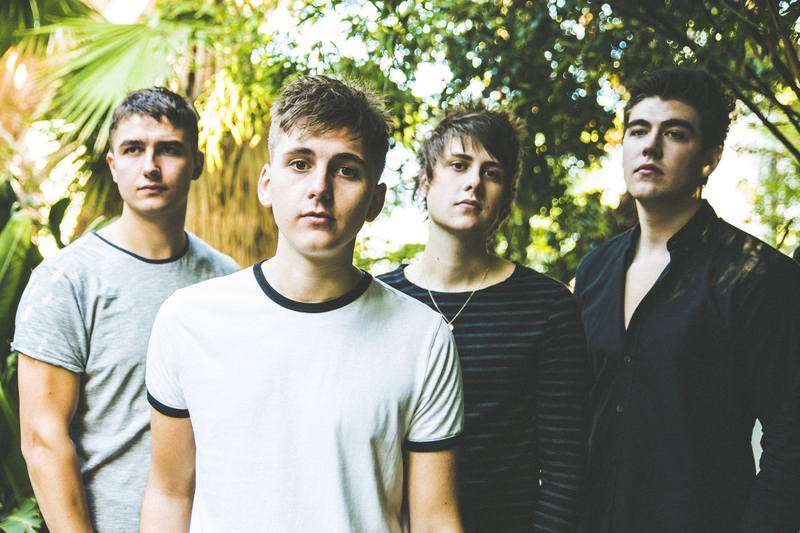 Right so you’ve got your new single “Was It Really Worth It?” out now ahead of your UK tour. How would you describe the sound of the new track, and what would your main influences be? I’d say for the sound, we wanted to get a good driving feel to the song, a little bit following “Will You Be There?” – the last single – we wanted that sort of drive and energy but not the same as “Will You Be There?”, we just wanted to try something a little bit different. “Was It Really Worth It?” is an older song than “Will You Be There?”; “Will You Be There?” is a pretty new song, “Was It Really Worth It?” has been in the setlist for years now, it’s always been a favourite of the band and like I say it’s always been in the setlist, but it hasn’t been a single so people have never really known the tune and it’s always been on our minds to release it as a single at some point. So coming from Sheffield, you must face a lot of comparison with the Arctic Monkeys, would you say you appreciate that comparison or do you try and avoid it? I mean, Arctic Monkeys are a great band, one of the biggest bands in the world. I love the Arctic Monkeys and I think they’re a top band but as far as our sound, we haven’t tried to keep away from it, I just think we’ve got a different sound. To some people maybe they can see elements of Arctic Monkeys but that’s not a bad thing. Yeah, you can definitely hear the influence. I suppose ‘cause we are a Sheffield band, it might influence us but we probably try and stay away from that sort of sound and don’t want to sound like them just ‘cause we get that many people saying it. The people that say it usually haven’t looked into the band that much, they see the word “Sheffield” and associate it with the Arctic Monkeys but I think we’ve got a completely different sound. I agree. I mean you can definitely hear influence from bands like The Jam and The Clash, so what would you say it is about that era that inspires you? Obviously it’s before my time but that doesn’t mean it hasn’t affected us. We’ve always had those songs played just in my Dad’s record collection or wherever, they’ve always been on or somehow you just seem to know them but you don’t know why, and it’s probably just because they’ve been played, you know, like you’ve just been brought up on it. Would you say the family is a big influence for you personally then? Yeah, I mean we’re a guitar band and we’ve been brought up on guitar music, that’s probably why we are the band we are, but we love bands like The Jam and The Clash, not just the music but their attitude and their energy on stage. It’s always something that’s inspired us. We just see these bands and they just look cool and look like they’re meant to be on stage and the delivery of the songs, I think it’s a nice little scene. I was going to ask about your influences for your live sets, bands that really influence you with regard to live music. Would you say that it’s the same sort of influences there? Yeah I’d say The Clash are up there. The Clash, definitely. Any that you’ve seen recently that you really like? I really like the DMAs, they’re an Australian band, I think they’re class. 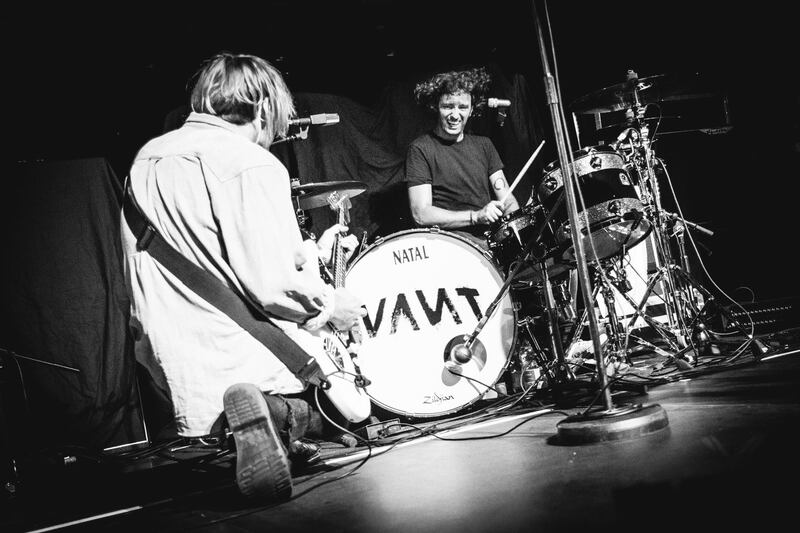 I mean as far as acting on stage, we’ve never been like one of those bands that… I’m never gonna be like Dave Grohl, running on one of those huge stages down the middle. Well, there’s only so much of that he can do with his broken leg these days! We’re just not one of those kind of bands, if I was doing that, that just wouldn’t be us, it wouldn’t suit us. It’s just delivery of the songs, not so much everything in between. Am I right you’ve got two sets of brothers that make up your band? How does that dynamic work, would you say it presents any extra challenges artistically or do you always get along and agree on things? Yeah, there’s me and Brandon, he’s the drummer, we’re brothers and Josh and Andy are brothers. We don’t always get along but we have more good times than bad. We don’t find ourselves falling out that often to be honest ‘cause we’re getting a little bit older now and we’ve stopped being as childish. We’re still very childish in ways but we don’t argue as much. There’s not really a lot to argue about to be honest. That’s good to hear, not too many Liam and Noel Gallagher moments then? Can I ask how the band started originally? Yeah, Josh and Andy moved next door to mine and Brandon’s grandparents about 6 years ago and we just became mates really, just started messing around together, playing football and just becoming mates and just doing what normal, everyday people do, just… chilling. Me and Brandon were messing around on our instruments at that point and we found out that Josh played guitar and we started coming up to our house and playing, just messing around really and playing a couple of covers, just making a bit of noise. Would you say you expected to be where you are today when you first started out like that or has that come as a complete surprise to you? It’s a surprise to be honest ‘cause I can’t say we planned to do everything we’re going to do or everything we’ve done so far as if it was always planned or we always wanted to do it, ‘cause we didn’t! And never even said “do you wanna be in a band?”. We didn’t just decide – “let’s just make a band”, “let’s see who can be in the band”, “oh what about Josh and Andy”. I used to just mess around on my guitar and Brandon used to mess on his drums but we never thought of making a band properly. So it’s all come about quite organically by the sounds of it. Definitely, and then when we started messing around in the garage, (laughs) we used to practice in a garage! When we started doing that it was the same, I can’t remember once where we said “do you wanna be in a band then?”, we just went from coming up to ours and having little jamming sessions to booking our first cover gig, it was weird how it started. Yeah, well you’ve come a really long way. I mean, you’ve supported The Libertines on their 2016 tour. What was the best part of that experience? Just arriving at the arena and just seeing it, taking it all in, thinking I’ve grown up with this band, we all have ‘cause we’ve always been into that music, we’ve grown up seeing this band on telly and seeing the music videos and loving the songs, and then getting to a point where you’re walking in to an arena thinking we’re supporting these in an arena tonight, and two more other dates! That was the craziest part really. That must have been amazing! Did you get to meet The Libertines? Yeah, we met them all. We met them separately, the first person we met I think was John – the bassist, we spoke to him pretty much as soon as we arrived, we spoke to him for a while. We met Gary quite a few times, I’d met him before as well, when they played a gig at Hyde Park we bumped into Gary backstage ‘cause we got invited to go down, so we ended up meeting him. I think we met Carl in the catering area and we met Pete after one of the shows. So yeah it was a good experience and I’m glad we did it! Yeah, that sounds amazing! You’ve played Reading and Leeds festival as well the last couple of years haven’t you? Any chance of a 2017 appearance? Yeah, the Festival Republic stage. Hopefully, yeah! We love that festival, it’s one of our highlights of the year really! We always have a good time at festivals, I don’t know if we’re a festival band, some bands just seem better at festivals. I don’t know if we’re one of those bands but we certainly enjoy playing them and every time festival season comes around we always seem to have a blast! Right, last little question, last week on the show we did a recap of our favourite songs of 2016, were there any that stood out for you? Stand out song for you? There’s a song, I used to call it “mel-born” and I’ve met the songwriter in that band called Johnny and he said it was called “mel-burn” so probably that! We do, and have done for over 20 years now, a pretty big excursion around the uk in the depths of winter and we play the theatres and the town halls and sort of major venues. We do about 35 shows in about six weeks. It’s our way of reaching out and contacting the faithful and hopefully making a new friends every night too. It’s sort of a little bit of a pay back because the efforts that people have to make to come to Cropredy every year in the second weekend of august which is, you know, the lynchpin of the year. But it’s great, it’s become an institution. We see many old friends, and it gets rid of the dark days of the winter for the people that come out to see us. I certainly noticed there were a lot of dates on the tour, there are (as you said) 35 dates over 6 weeks. It’s a massive tour really, isn’t it? For a bunch old gits, yes. No, well we take Mondays off now. In the old days, we once did 42 shows in 44 days when we were younger, but then, it’s what we like to do. Fairport’s always been about touring and playing live gigs. We make records, certainly, but they’re more like souvenirs of where the band is rather than an attempt to storm the charts and change our profile generally. It’s always been about the performance on the evening and getting in the van and going off to the next show – we’re a live touring band and fifty years in now. So am I right in thinking that with this kind of show it’s a lot about the performance on the night, as in it might not particularly reflect the record as is. Well, we do have a new record coming out which we hope to have for sale on the tour – if it comes back from the factory in time. That is something that doesn’t happen quite as frequently as it used to in the early days, but we do a new album every two or every three years. It’s half new stuff in the studio, half live material from quite recent performances. We call it 50/50 at 50, it’s to show what direction the band’s heading in, if you can tell that from a few songs that are fresh to the repertoire and to show what our strengths are in live performance with this lineup. I could say new lineup, but it’s actually been together for 18 years now, which is far and away the longest existing Fairport lineup ever and if you think about that, that’s nearly 3 times longer than the Beatles had been together. The last time I saw you was in St. Helens in 2014, and you played two sets across the evening. Should we expect something similar this time? On the winter tour, we do actually take out a support act with us and this year it’s Sally Barker – you may remember her name from the voice a couple of years ago. She was Tom Jones’s pick. She’s an old Folkie friend of ours and it’s great for her – it’s great for all the support acts because they get to introduce themselves to our audience. Hopefully they’ll bring a few friends who maybe haven’t got round to seeing to Fairport, and over the course of the 6 weeks, of course we get to know each other even better. There’ll be some interaction between us I hope she’ll end up singing one or two songs with us. We’ll certainly be playing something with her, that’s kind of become another tradition on this winter tour. We’re kicking off in Glasgow at the opening run-up to the Celtic connections festival, which is a big deal up there. We’re including a show or two in Ireland, which is a place we’ve not been for a couple of years, then it’s business as usual around the rest of British Isles. You mentioned that there’s a lot to do with bringing the tour around to repay old fans that have been with you for a long time and making friends along the way. I know personally Fairport Convention has been something that’s passed down from my father, much like most folk music is passed on through the generations. Do you think that bringing a support act helps include newer audiences? It just broadens the net and makes it a bit more interesting. Sally’s a very strong performer in her own right as well being somebody with an incredible vocal talent. She’s got great taste in songs and writes some good stuff too. there’s a lot of interest and good stuff on display in the evening. The thing about Fairport is that you’re not alone in that you’ve grown up aware of the band through your parents interest. There are a lot of youngsters that don’t know about any lineup previous to this one. You don’t have to be an expert in the history of the band to enjoy what we do because when we go on stage as Fairport Convention now, fifty years in, we’re not fooling ourselves (or anybody else) that we’re teenagers. We’re not pretending we’re the same people we were when we made those early records. The music has grown with us. We’ve changed, the music’s changed, but it’s still essentially the same band and some of the earlier songs are still the same songs. If we ever became a tribute band to Fairport Convention – I’d be leaving, I’d be off. With all of the lineup changes, I think everybody brings something different as well and that is where it all keeps moving forwards, isn’t it? Every time you do have a lineup change, we’ve never changed and sought to replace who’s left. It’s always been about “Well, what can we do here? How can we take the band into another area by utilising the talents that the new person brings along?” and that’s been a watch word and it’s been a very successful one and I’d recommend it to anybody who finds that the band is up for a change or somebody wants to move on to something else or heaven forfend some disaster befalls you and you lose somebody. Change is opportunity and we’ve always made the best of it. With the Radio show that we do at Radio Hud, we have a section called “Prog Snobs” where we play progressive styles throughout the ages. We like to try and introduce listeners to different elements of progressive music and Fairport often make appearance on the show. 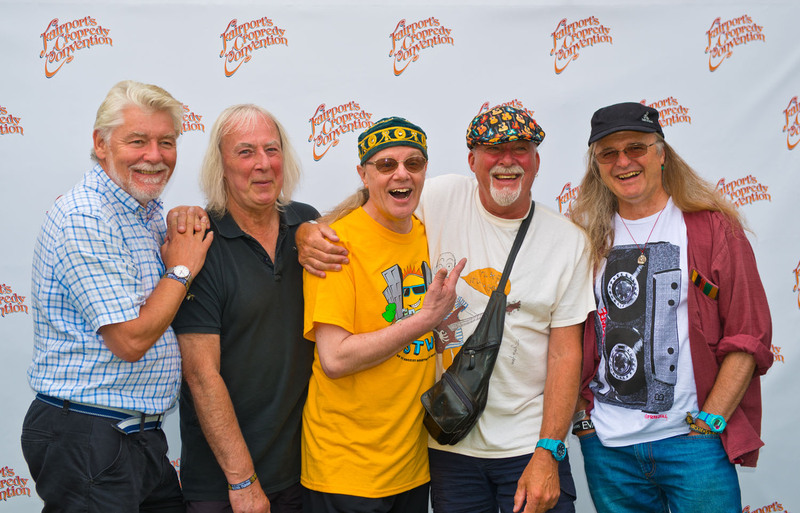 What would you recommend as to what you’d recommend to try and get new people into Fairport Convention? Well there’s a fantastic band that started around the same time as us in California called “Love”. I don’t know them? They were fronted by a songwriter and Singer called Arthur Lee. And their first self titled album, I think it was just called “Love”, it might be called “Seven and Seven Is” But the track seven and seven is off that album, is a real kick in the arse. It’s a fabulous track, and it certainly doesn’t sound 50 years old. If you want to play that with my hearty endorsement, then please do! I was going to ask as well, over the 50 years of Fairport, what would you say has been your proudest moment of favourite release with the band? I’m hugely proud that the band is still here and without achieving and significant business success, we’ve become part of the landscape of the country musically and socially. There’s something about the name. Only this morning, do you know the daily mash? There’s a great article in the daily mash, today, about how a hipster cafe in Kilbourne is now playing Fairport Convention tracks to drive out the worst kind of hipsters. So you know, they wouldn’t use that name in that context unless we had come to mean something. That we’re part of the public consciousness. So I’m very proud of that, that we can have the mick taken out of us is something that to be deeply proud of, so that’s pretty up to date. With the prog snobs clientele that we have, a lot of us are very into the music tech sides of things. With wormwood studios and your latest release of Myths and Hereos. Across the time of your recording, how do you think the process has changed, wether as a unit or within the studio itself. Oh, it’s changed several times since I started, you know. It was unbelievably primitive by today’s standards, but on the other hand it was much simpler. And simplicity in itself is sometimes a good thing. Nowadays, if you’re not careful you can become bogged down in the choices. I appreciate the technology and the cleanness and the control, the detailed control that we now have when we’re in the studio but I’m determined not to let it mask the essence of the performance so that it doesn’t become an end in itself. Well, it’s a toss up between that and the material. The material is probably the more important of the two if you got the red hot pliers out I would have to say the material more than the performance but they’re a close second. Your song ‘Home’ was about getting lost in London, is that right? Was it locked, were you trapped inside? No it wasn’t locked, they have an emergency button so I got my phone light out, found the button, pushed off and then I could see a little glimmer of light in the distance and found my way. I was only a mile away from my house so I walked home. I’d been at a rubbish party that I wasn’t really about and it was just a bit of a weird night so I ended up writing a song about it the next day. Do you find yourself doing this a lot with song writing, finding inspiration from situations like that? Yeah I try and write about things that have actually happened to me rather than things I can’t relate to. I find it really hard to make up stories about wizards and Gandalf and Lord of the Rings type things so I try and keep it as real as I can. I don’t always try and get that, if my friend’s got a good story I’ll try and work that into a song but it’s gotta be something that’s happened to somebody. Can you tell us a bit more about any of the songs you’ve got out at the moment? I’ve just released a song called Play Dead, I think it was last Friday, it’s doing quite well on Spotify and stuff; it’s made it onto new music playlists. It’s basically written about me and my girlfriend if there was a zombie apocalypse, what we would do. Have you got any more songs coming out in the near future? I’ve got a couple of acoustic songs that will be coming out before the end of the year, three of my favourite songs. Just me and a piano, or a guitar, kind of stripped back and then in 2017 I’ll be working on my album and that’ll be coming out in 2017 at some point. Grafting to get stuff done. How has the tour been? Have you done touring before or is this your first taste of touring? I’ve done touring before but normally it’s one gig a day and this has been, on some days I’ve had three gigs and although they’re only a 20-minute set, it’s more the driving to a different city so it’s been a bit tiring. More so the travelling but it’s been wicked, I’ve met loads of nice people, been to loads of cool student unions on the way so it’s definitely been beneficial. Something you want to carry on doing? Yeah absolutely. I’d be well up for doing it with a couple more people cause I’m doing it on my own and with one of my mates but it’d be nice to do it in a van with a bit of a band and a bit of banter we can have on the way and all that stuff. What comes first for you? Is it the song writing and being able to get your thoughts out there or is it more to do with the experience of touring as an artist and being able to develop yourself on tour? If I’ve got new songs and people haven’t heard them, it’s a good place to try them out on tour cause you can get people’s reactions straight away and see what they think. I like writing songs and going out and gigging them and seeing what works and what doesn’t work and seeing what ones I need to scrap [laughs]. I hasten to ask this but have you had any bad gigs with bad audiences? Have you had any poor experiences? I was in Bath for one of the Coffee House things at a sports university and the sound was a bit iffy and it was really early in the day, I think it was 11 o’clock. People had obviously just woken up, it was Fresher’s Week, everybody was really hung over; the last thing they needed was me just belting out full blast on the stage. I think everybody was just a bit like “oh no” but that’s definitely not the worst gig I’ve had. What sort of things do you have on your playlist, what do you listen to and find yourself inspired by? Tom: There’s a lot of good music going round at the moment, I’ve been listening to a girl called Ray BLK, she’s got a song called My Hood, she’s absolutely amazing. She was on Jools Holland last night actually, she’s wicked. There’s a guy called Sam Henshaw who I just did a gig with recently, he’s a soul, kind of blues, bit of rock artist and he’s wicked. 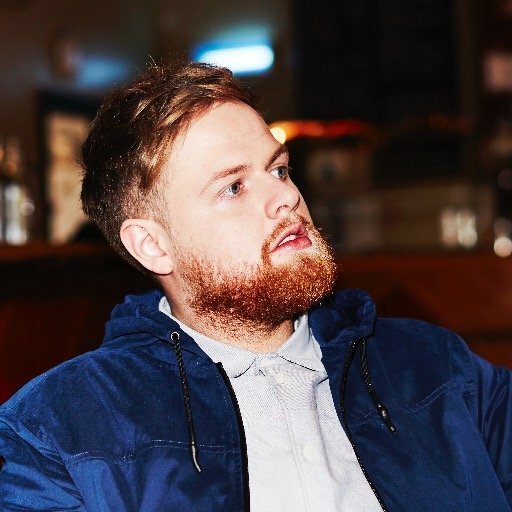 Big fan of Jack Garratt, he’s got a load of good stuff coming out so there’s loads of good music going round at the minute: I’ve got a playlist of tunes that are all my favourite and it’s up to and it’s up to 150 tunes so it keeps getting bigger every week cause there’s so much good stuff out at the moment. Do you find the music you listen to is very similar to the kind of stuff you like to write or do you feel the music you listen to can be a completely different experience? I try to break away from stuff that sounds like me so I can develop my sound by listening to artists that are different. As long as it’s a good tune and a good song I’ll be into it. I’m not like “I only listen to rock music”, I listen to a bit of everything. Looking to the short term future, long term future, where do you see yourself in a year’s time and five year’s time? That’s a good question. A year’s time, hopefully playing some really big gigs. I just warmed up for Sam Henshaw at the Village Underground on Monday and he sold it out, there was 850 people there, and I was the support act so I was expecting nobody to turn up but everybody was there and his crowd were really enthusiastic. You know when you go and see a gig at the MEN Arena and people just talk through the first act, his crowd were really good and very nice. I think my goal is in a year’s time to sell out that and do the same thing; have someone warm up for me. And how about long term? Are you not looking that far ahead? Five years is a long time. I’d like to play Wembley cause that would be amazing, that’s a big goal but 5 years is a long time as well. Yeah, that’s the ultimate goal, I think, sell out Wembley 3 nights in a row; it’s a big goal though [laughs].